This is the very last card I created at retreat, there is no more to show. I will have to show you what I have been making at home for the past couple weeks next time. This card wasn’t a challenge, but I saw someone else make one and decided to make my own. These rosettes seem to be the “in thing” at the moment and I can’t miss out on it. LOL! I used the stamp set Spiced Paisley and Fabulous Phrases. Colours used are Soft Suede, Pool Party, Very Vanilla, Pear Pizzazz and More Mustard. The designer brad is a Pool Party Printed brad. 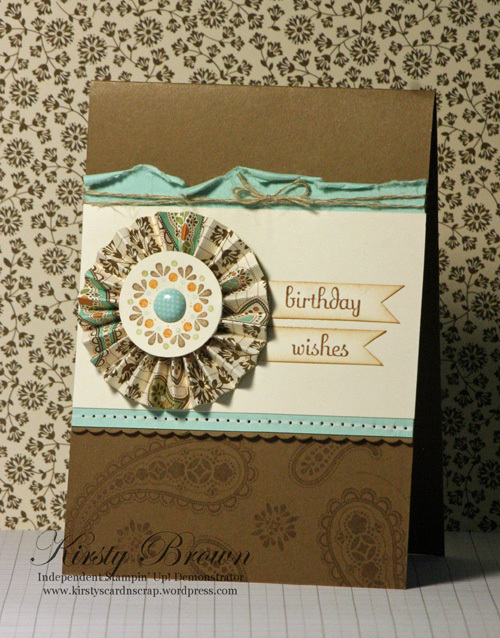 I think I might make some more cards with this rosette, I think it is awfully cute! LOL! I’m back again! I have cheated however. 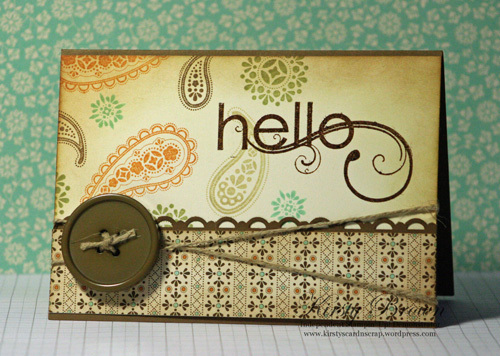 I made this card last week with the Spiced Paisley ‘Hello’ card. But I think it better I share them individually rather than all at once. Otherwise there would be no eye candy for a whole week. LOL! On that day I decided to play with some stamp sets that I haven’t really played with a lot since getting them. Build a Blossom was one of them. As you can see I also used the Spiced Paisley Stamp Set. Hahaha! Seem to be a new favourite of mine. I didn’t see that coming! I used the strip of circles stamp out of the Spiced Paisley Stamp Set to create the BG on the Very Vanilla and the biggest paisley for the Perfect Plum base. The other two colours used are Lucky Limeade and Red Riding Hood. A rather cute combo I think. It’s been a little quiet here on my blog over the holidays, and now the kids are back at school (3 weeks now), I hope to get a routine in place for regular blogging and crafting. 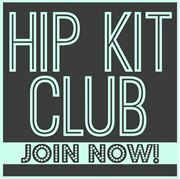 I have received a few emails asking where I am and that they miss my inspiration and some even asking if I have quit Stampin’ Up!. I know I haven’t responded to everyone yet, please bear with me. I promise to respond to all. I definitely haven’t quit SU! There has been some changes but definitely not leaving. LOL! I am also very flattered so many miss my little creations and I am very happy to inspire you all. I hope I continue to do so. I can say though that I have been struggling to clear my head space to actually sit and craft. Life has just been crazy and here I thought I would have more time on my hands with my last one at school! HA! That’s a joke! I seem more busier. But I think that’s because I have taken on more school duties, because I can. It has affected my routine at home but I can see light at the end of the tunnel and should be back on course soon with a new routine in place. 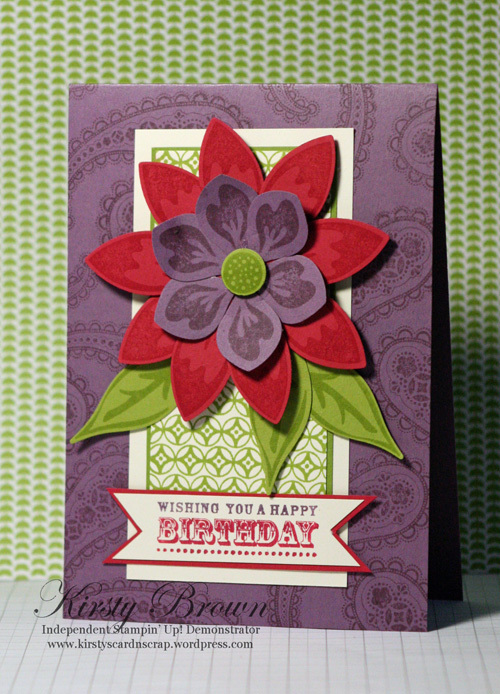 I know so far that I will be scrapping on Wednesdays and card making on Fridays. All other days are taken up with school activities…..I think! LOL! In the past couple of months I had hoped to apply for some design team positions that were doing DT calls, but I missed out on applying for any. I just couldn’t get my time organised to create some new projects to apply with. I will keep my eye open though for others and if you know of any let me know. Being on a DT will help me get back to being regular! LOL! This is really simple but I love how it has turned out. I paired the new stamp set Spiced Paisley available in the current Summer Mini and the stamp set My Friend from the current IB&C. I think they go together quite well, but then again I think that ‘hello’ stamp goes with pretty much anything! LOL I also used some coordinating DSP Spice Cake. Very yummy stuff. I used colours More Mustard, Pool Party, Soft Suede, River Rock and Pear Pizzazz. A surprisingly gorgeous compilation of colours I must say.